Deputy Darren Murphy is at right. Which has the most weight in a court of law — the testimony of a law enforcement official, or that of an average, law-abiding citizen? A rare opportunity to see, and hear, how some San Luis Obispo County sheriff’s deputies view the U.S. Constitution is contained in a 22-minute “mini-documentary” on a news website just launched. That opportunity is presented by deputies themselves, talking into their shoulder microphones and standing in front of their vehicle-mounted cameras. In this case, the recordings tilt the argument in favor of the citizen… in a big way. Deputy Darren Murphy is featured in the first video report by KCCN.tv, a project of Central Coast News Agency. Murphy leads a squad of heavily armed deputies into the yard of a North County man, then into the man’s house , and ultimately, into a locked gun safe. 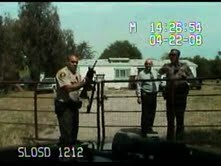 Sheriff’s department recordings made by the deputies themselves clearly illustrate their lack of concern for individual rights; deputies can be overheard manufacturing reasons for the intrusion into the home, the gun safe, and for the pending arrest of longtime resident Matt Hart. The video report is the first of what Central Coast News Agency editor Daniel Blackburn says will be monthly offerings by the new Web site. Blackburn, who helped found CalCoastNews.com, cited “Deputy Murphy’s uncensored, darkly disturbing observations and behavior following his Code 3 arrival at the rural home of Hart. Those utterances were picked up by Murphy’s and other deputies’ own recorders,” Blackburn said. “Those recordings provide a rare, frighteningly revealing, behind-the-scenes perspective of how one local law enforcement agency views the Fourth Amendment to the U.S. Constitution, and other laws its personnel are sworn to uphold,” he said. Watch the full video documentary at KCCN.tv. Note, you may have to download plug-ins in order to view the video.